Hooooly Cow. This session was really above and beyond. 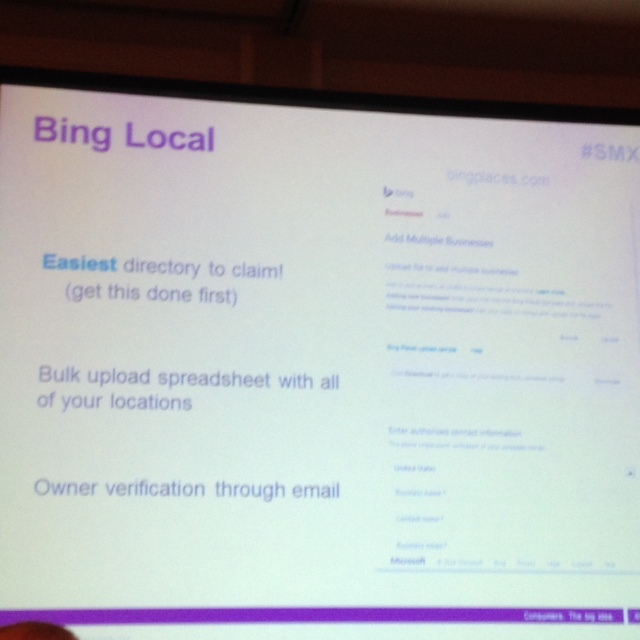 If you need to set up or optimize your local presence, please try to wade through this fast and furious SMX West 2014 coverage; there’s a lot of really helpful, actionable information in here and I tried to format it into a list form to make it easy to consume. 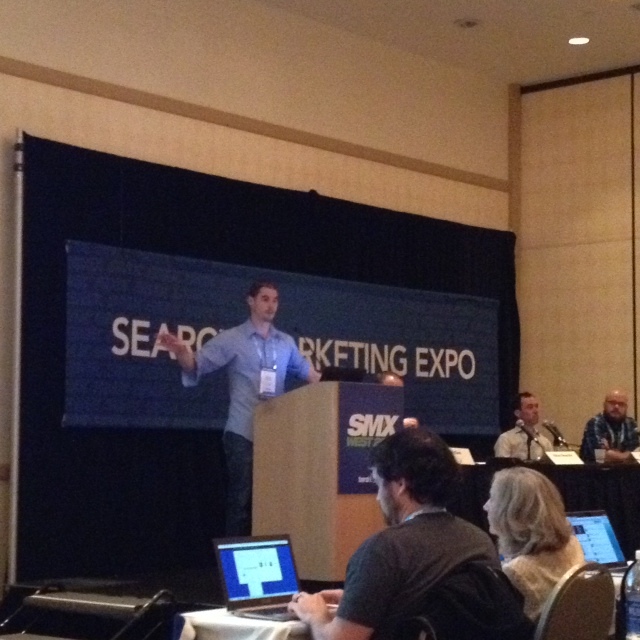 Nolan Alexander speaking about local search optimization on day three of SMX West 2014. Up first is Adam Dorfman (SVP Elocity). A quick Places vs Local rundown; this is where we stand → Google+ Places is turning into Google+ Local; Keep in mind, as of now (March 2014), you are still going to see both types of pages when you’re searching. How to spot the difference: When you are looking at Google Pages page you will see a map in upper right of the page. When you are looking at a Google+ Local (or merged Google local) page you’ll see a header image (and the page will look kind of like a G+ page). 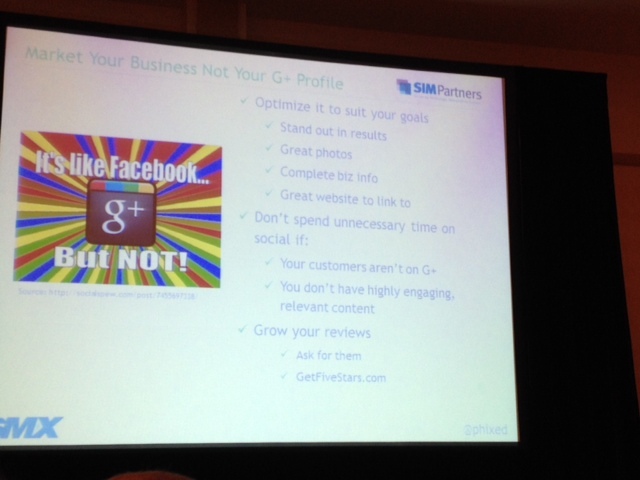 1) When youre optimizing for G+ local, optimize to suite your goals – to suite your customers. Not necessarily to suite Google. 4) User a banner image, on-page pictures, and videos to customize your page. A more personal experience is generally a better experience. By customizing and decking out your G+ local age you can differentiate yourself from your competitors. 5) Don’t merge Google+ Places with Google+ Local… Google says just be patient and wait. 6) Go granular with your category. It’s easy to want to go broad; to want to choose a high-ranking category to rank more often. What you really want to do is choose a specific category. 7) Your description is not going to have a lot of impact on your rankings, but it can really help you funnel people into a conversion path. 8) You can now put a descriptive word in your business if it makes sense (for instance Starbucks downtown; not Joe’s best pizza delivery). Don’t use adjectives! Just descriptive words that help usability. 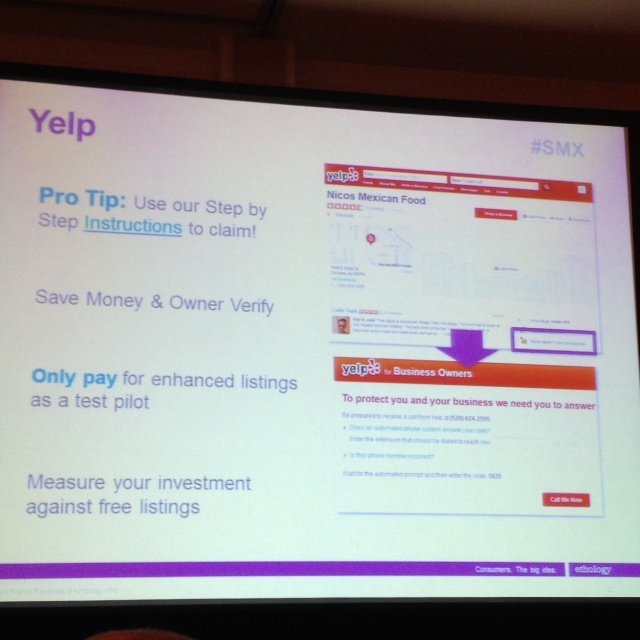 9) Maintain your listings according to how they perform. That said… doing nothing can actually be a tactic! Don’t overthink things. If you have a first page listing and you try to overthink it, tweaking things and changing categories and making changes just for the sake of changing things will very rarely have a positive effect, and it may even make you drop down. Don’t overthink it! 10) Identify and remove duplicates on Google and other sites. 11) Remember photos improve click through rate. 12) Create custom business descriptions using primary keywords. 13) Continue monitoring and modifying listings based on performance. 14) Make sure you information is accurate across all platforms, and social media. Here’s why Adam thinks it’s imminent… there are so many bugs in Google Places right now and Google isn’t showing any sign that they are trying to fix these bugs. For Adam, this makes him hopeful that a big overhaul is on its way. Up next is Nolan Alexander (@Nolan_Alexander; @Ethology). Should I Be Owning/Verifying/Optimizing Directories Other Than Google Local/Places? YES! Directories help Google, and they help Google directly because of Mobile. Own, verify and optimize the ones that are right for you. That’s the key. Important! How is your local business represented on Mobile?? 84% of smartphone owners regularly use map applications and 87% of users regularly use social media applications. If a directory has a mobil application, that is something you should target and optimize for. Figure out which ones are being used the most and target those citations. So where do I start with mobile app optimization? Prioritize! Which are easiest to tackle first? Which are the most effective? Run a local audit – Do some research! 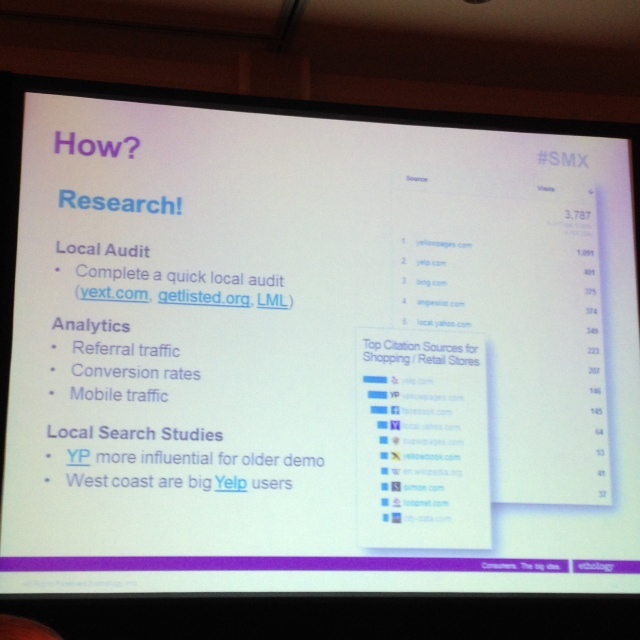 Use a service like Yext, Getlisted.org, or LML to do a complete quite local audit. Congratulations! At this point, you (theoretically) now you have an idea of what directories are worth! Now what…? After Google+ Local, what’s next? 1) Bing Local. SO EASY TO DO. Seriously. Do it right now. It will take less time than reading this blog post. 2) Get listed with Yellowpages for free. This one is kind of a pain; not as easy as Bing, but it’s not horribly hard and worth the time. 3) Yahoo Local is pretty horrible to deal with. Paid placement is about $10 per month and updates take about 3 months. Look at the analytics; is this listing driving traffic? If it’s not, don’t even do it. 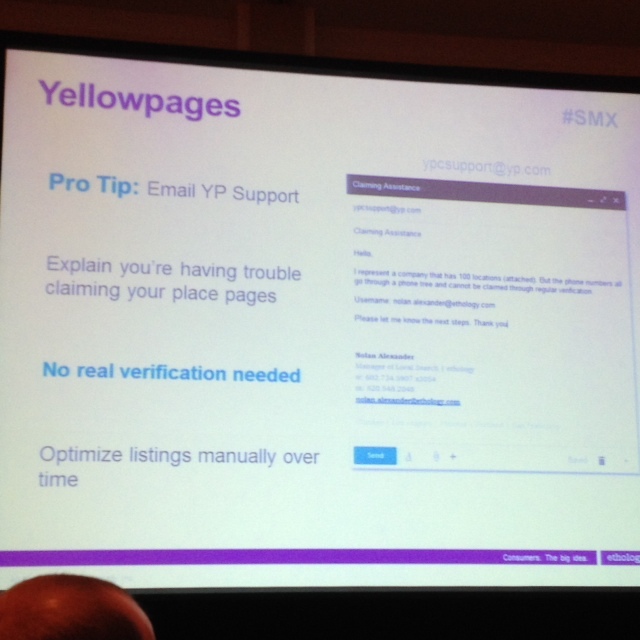 If you are going to list with YellowPages, only verify through email (never use that stupid postcard). 5) Yelp! Highly suggest: before you pay for listings get the free stuff first. See how the free stuff is working and then go from there. Pro Tip: Please make sure you have a dedicated email address for all of your listings!! ONE EMAIL ADDRESS! Seriously. This will save you a ton of time. 4) Align local tactics with your digital strategy. Be a strategic holistic marketer. Align your local content with your overall local strategy. If you see coverage gaps in organic search, you can go after those gaps with Local. Last — and definitely not least — is a presentation from Greg Gifford (@GregGifford). This presentation was so awesome if I could swear in this blog I would. It was good. Local SEO helps you grab the attention and stand out from the others. Some background: There was a huge shift in the local algorithm from Oct-Nov 2013. Because of this algorithm shift we’re seeing more search results in the search results and no more blended results (which means you can show up in the MapPack and the carousel and organically). This is a huge opportunity for businesses to rank: You just need to include city/state in title tag! Seriously. DO THIS! Add City/State into the Title tag, H1 heading, URL, Alt attributes, Images (and you should hae images on your locaton landing pages), meta description. Add your phone number into your meta descriptions and into your content. Embedded a Google map onto your page. Preferably, embed Google map that points to your G+ location. Create amazing content! Create content for the people; for your people. Make your blog a local destination. Blog about your community; don’t just bog about your business! Don’t just talk about yourself. Sponsor local events. Do this so you can write about it on your blog! Remember Citations are like your online proof of identification. Use them! Use citations and get mention of your citations on other sites. (Arguably these are the prime factor in local rankings.) And make sure to put your NAP in blog posts (Greg considers blog posts like an unstructured citation opportunity). Do you pay someone else to do your local optimization for you? Or do you do it yourself? WhiteSpark and BrightLocal are both excellent options if you don’t have the internal resoures. Use GetListed.org as a citation source if you want to do it by yourself. Go there, run your business name and your phone number and it will tell you where your gaps are, where you need to be listed, and any duplicate pages that need to be removed. Make sure your citations are all consistent!!!! Then, dig in with WhiteSpark if you want to do citation research. Think: You have to be where Google expects you to be. Himanshu: That is an excellent plan for local optimization. The idea of uploading a barcode is innovative! Thanks for sharing your tips. Creating Google listing is a very brilliant idea to grow local business. My personal experience about Google listing is bit different as I’m getting high traffic from my Google local listing. – Get minimum 5 reviews from your customers so that Google will show stars with rating based on reviews on SERP. – Upload barcode to your listing so People can scan as it’s the time of smartphones. – Don’t forget to use your contact number in Description to increase conversion. – Create listings on other local listing sites and make them reviewed by customers becoz Google also look at it and show those reviews on SERP too. These days I get the sense that local optimization is a lot like baking a great cheesecake; everyone has their own recipe. Some work great, some are awful, and some are just simply different — not better or worse, just different based on the baker’s (optimizer’s) unique intention, goals, and preferences. Thanks for sharing your Local Optimization recipes with us here, Andy + WhiteHat (mystery optimizer)! – engage only with local people by following & advertise your social pages/profiles to them, after that you can react with your targeted people via likes/plus ones/favorites/pins, comments & shares/reshares/retweets.